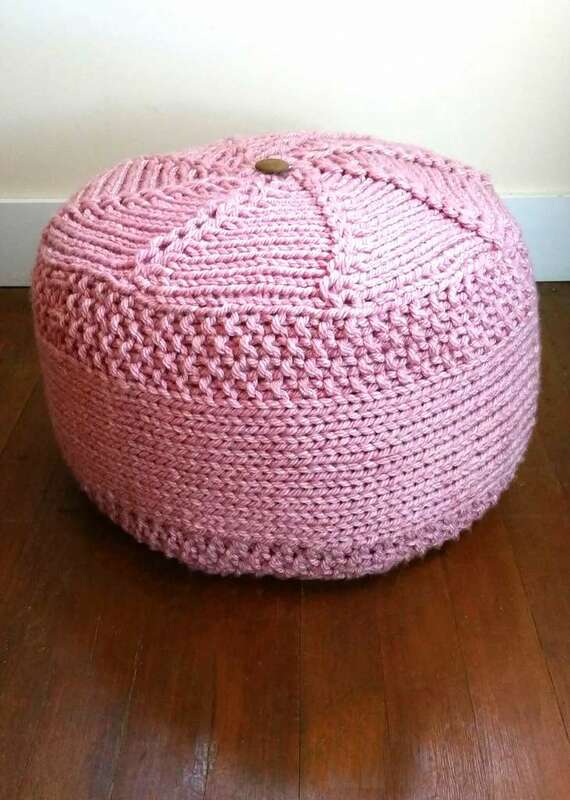 Loom Knitting Advent, day 24 of brings you a wonderful addition to your home decor: the Zippy Foot Pouf! I have always loved the look of those oversized knitted foot poufs that seem to fairly scream, “I’m cushy and soft, and your house will be so much more cozy with me in it!” Well, as soon as the Zippy looms came into being, I knew that recreating one of those adorable foot stools was now a possibility! Another fun thing about this project is that it will give you the opportunity to put those tired linens you may have hanging around your house to good use…what a terrific way to upcycle, right? Knitting loom: (5) Zippys and connectors (or 20 peg equivalent if using the Zippy Corners). Yarn: Red Heart Grande (46 yrds per skein), super bulky #6 weight: approx 9 skeins (in color: currant) **Note: this yarn is very bulky for a #6…almost rope-like. If you substitute a yarn of a thinner width, you’ll possibly need to hold 2 strands as one throughout to get the desired thickness for the project. Notions: loom tool, 6.5mm crochet hook (for cast on and help with possible missed stitches, etc), scissors, wide eye yarn needle, row counter, knitting pins, removeable stitch markers or bits of scrap yarn, one large decorative button (if desired), stuffing of choice (see Pattern Notes for more details on this). As this is working with very large pegs, knit with a snug (yet not too tight) tension throughout. 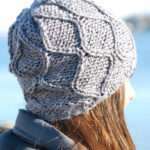 Using the U-stitch as knits helps achieve a fabric that is not too holey for your finished pouf. Notes on Stuffing: This project allows you to use those tired, worn out linens, duvets, and pillows you may have lying around the house, but don’t have a use for. If you are quicker than me about destashing cupboards and don’t already have these items, lol, a trip to the second hand store of your choice would be a very inexpensive way to aquire a good selection. Make sure that you have laundered all items before using to stuff your pouf. You will need a pretty good stack of sheets, blankets, etc, to get a firm pouf that will easily support your feet. The sample uses 2 fiberfill pillows propped up on their sides and rolled together in the center, with all the blankets and sheets wrapped evenly around them to fill out the pouf. Connect 3 Zippy looms together for a total of 12 pegs. CO to all 12 pegs. Prepare to create a series of 8 short row wedges. Step 13: S1, K7 (KO 2 over 1 on peg with 2 loops), W&T peg 9. Step 14: K8 back to peg 1. Step 15: S1, K8 (KO 2 over 1 on peg with 2 loops), W&T peg 10. Step 16: K9 back to peg 1. Step 17: S1, K9 (KO 2 over 1 on peg with 2 loops), W&T peg 11. Step 18: K10 back to peg 1. Step 19: S1, K10 (KO 2 over 1 on peg with 2 loops), W&T peg 12. Step 20: K11 back to peg 1. Step 21: S1, K11 (on 12th peg KO 2 sts over 1). Step 22: S1, P10, K1. Repeat Steps 1-22 seven more times to create a total of 8 wedges– except on Step 22 of 8th wedge. Leave any length of yarn in place without cutting…this will be used during the assembly of the pouf later. Using yarn tail, seam up BO and CO edges, moving toward the center of circle. Gather the loose stitches at the inside of center and cinch tightly. Knot and trim. 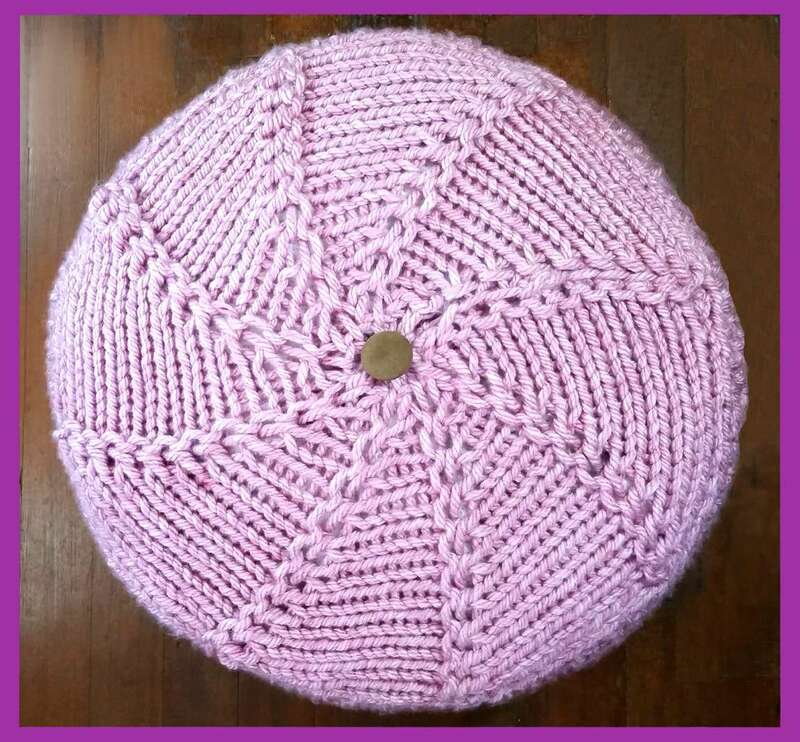 If desired, a large, decorative button can be sewn to the circle which will be the top of the pouf. To achieve a flat and uniform shape, block circles lightly. Connect 5 Zippy looms together for a total of 20 pegs (alternatively, 4 Zippy looms and 4 corners could also be used). CO to all 20 pegs to work as a flat panel. A- K1, P1, K1, P1, K12, P1, K1, P1, K1. B- K2, P1, K1, P1, K10, P1, K1, P1, K2. Row 18: Work Row B above, but on the first and last loop of the row, add either a removable stitch marker, or a small piece of scrap yarn as a place holder. BBO all sts. Leave a long tail for seaming sides together. 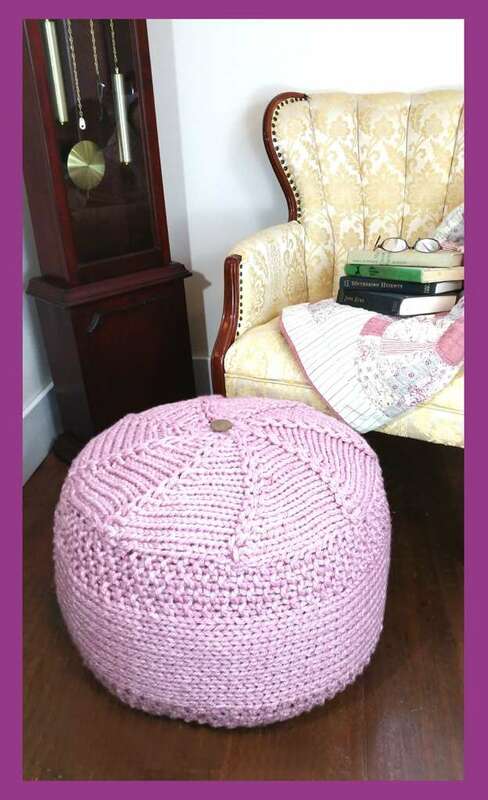 Using the knitting pins, secure the bottom of the pouf to the sides. Match the markers used on each 18th row of the sides to the long lines of the pouf. This will aid in keeping the pieces lined up correctly while seaming. 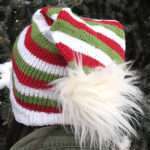 Using the long BO tails, seam the bottom to the sides. Begin adding the stuffing to the pouf (see Pattern Notes for more instructions). Start with the rolled, on-edge pillows, then wrap blankets and sheets, etc snuggly around them. Keep building from the bottom to the top, until even with the pillows’ top edges. Keep pulling the sides and bottom of the pouf up around the stuffing to create a firm base and sides. The idea is to create a firm cylinder of stuffing that doesn’t bulge outward when pushed down upon. Repeat the same procedure with the top piece of the pouf as used for seaming the bottom. Stop before seaming all the way to adjust stuffing as necessary, or to add additional items to fill out pouf. Once the pouf is smoothly stuffed, complete the seaming process. Pull all tails to the inside. What a clever and lovely design for a gift or for your own home. Love it! Oh, thank you so much, Jacquelyn! 🙂 It works up pretty quickly, too…love those Zippys! Fantastic design, Bethany! I can definitely see one of these in my future. Oh, thank you, Brenda! I really love how it turned out…really enjoy those big knits! 🙂 I would love to see yours when you get it finished! 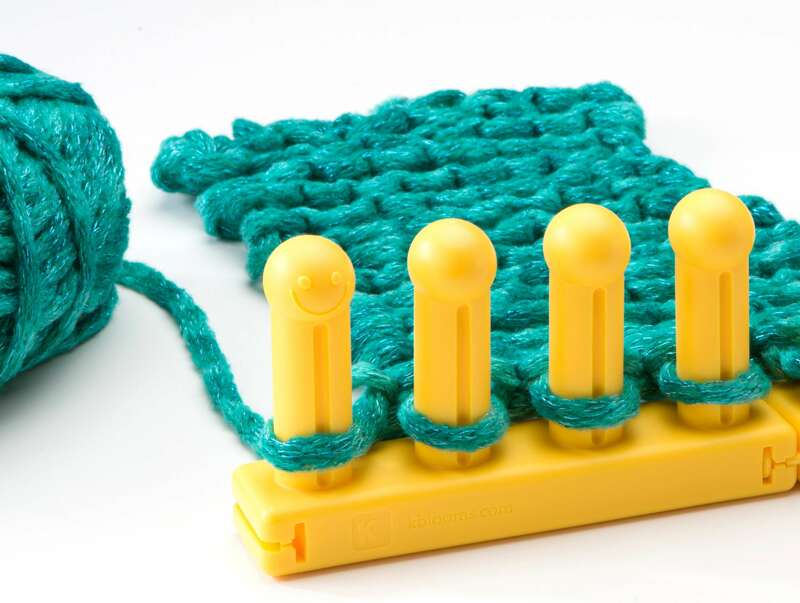 I don’t have a zippy loom yet, but now I want to buy one just for this project. 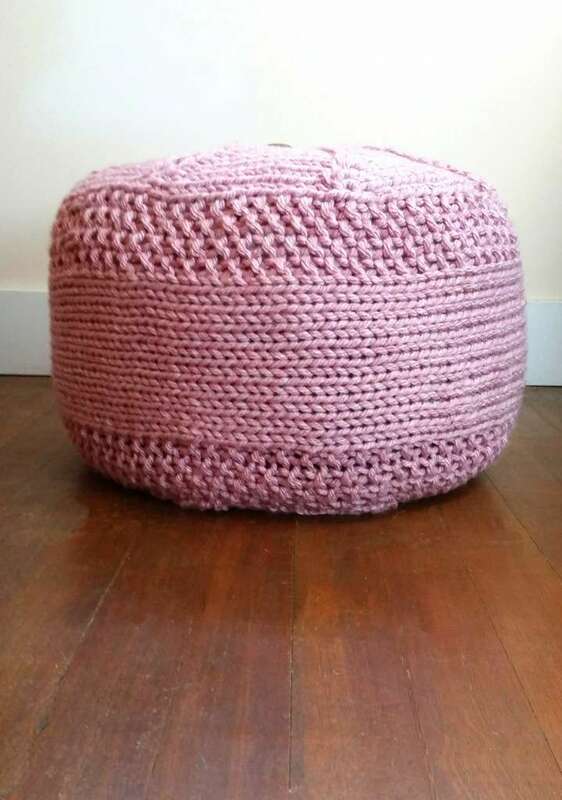 I really want to make this cute pouf now! I love it Bethany!